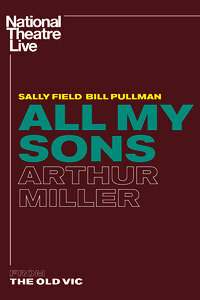 All My Sons by Arthur Miller directed by Jeremy Herrin Broadcast live from The Old Vic in London, Academy Award-winner Sally Field (Steel Magnolias, Brothers & Sisters) and Bill Pullman (The Sinner, Independence Day) star in Arthur Miller's blistering drama All My Sons. America, 1947. Despite hard choices and even harder knocks, Joe and Kate Keller are a success story. They have built a home, raised two sons and established a thriving business. But nothing lasts forever and their contented lives, already shadowed by the loss of their eldest boy to war, are about to shatter. With the return of a figure from the past, long buried truths are forced to the surface and the price of their American dream is laid bare. Jeremy Herrin (NT Live: This House, People, Places & Things) directs a cast including Jenna Coleman (Victoria), and Colin Morgan (Merlin).